In the first part of this post, we set the stage for understanding the evolution of High Definition and beyond. In this post, we’re going to elaborate on higher definitions and what they’re be good for. The first time I saw an Ultra High Definition (UHD) television screen (or maybe it was true 4K, I don’t recall) it was next to a 2K screen. I looked really carefully at both screens. The UHD screen was a bit sharper, but I can’t say that I was overwhelmed by the difference. That was in 2013 at the National Association of Broadcasting Show (NAB) when UHD was brand new. It’s possible that the source signal was actually only 2K, so the differences between the two pictures were not as pronounced as they otherwise might have been. Drop on by your local electronics retailer and spend some time looking at new TVs and you will see marked differences between HD and UHD screens. UHD TVs are definitely sharper and newer screen technologies like IPS (In-Plane Switching – a variation on LCD flat panels) and OLED (Organic Light Emitting Diode – better blacks and higher contrast ratio) make for better blacks, color reproduction, and easier to watch off-axis (on an angle). But do you actually need a 4K television? Well, the simple answer is maybe, but it really depends on the size of the television and your viewing distance? Why? It’s because your eye has finite resolution. To test this theory, look as something detailed up close (like a fine-grained pattern in a piece of fabric – yes, your bedspread is fine) and then look at it from a distance. You can see the pattern close up and you can’t at a distance. Your vision is finite. 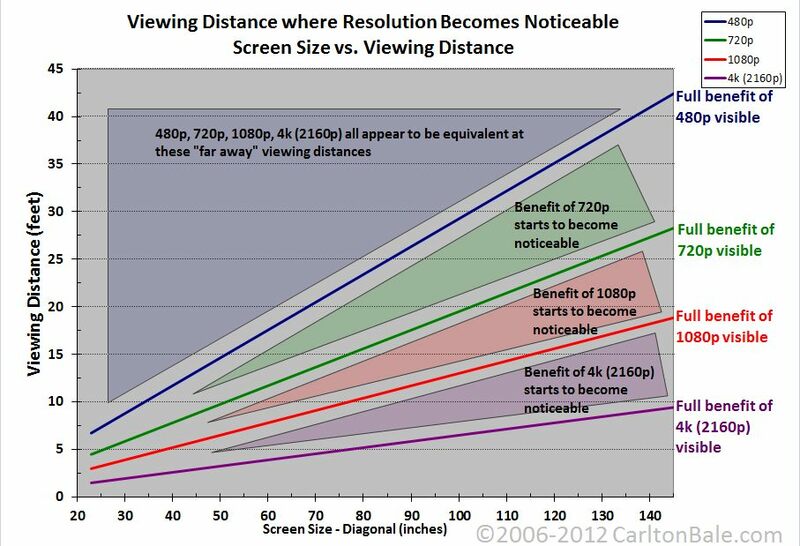 If you look at the below chart, produced by CarltonBale.com, you can see that different resolutions are viewing-distance dependent. If you need a big screen because the viewing distance is greater, than perhaps a UHD television makes sense for you. The other thing to consider is the source. There are few broadcast 4K channels right now. DirecTV has some media being beamed in 4K, Netflix supports UHD media, but for that you need an Internet connection capable of download speeds of 25mbps or higher and that’s often expensive and simply not available. Blue-Ray will support UHD in the future, as well. Even though all of these various sources may not be native UHD right now, they are on the way. UHD TVs are sharper. Yes, you really can see the puck or the golf ball, better. If that’s something that’s important to you then get on down to the store and pick up one of those bad boys! So it seems that in some cases – based mostly on viewing distance – UHD TVs make sense. However, eventually all new televisions will be UHD, so if you’re in the market to buy a new TV, chances are that UHD is the way to go. What about cameras and capturing media? Does is make sense to capture video in 4K? Is that a big deal? Is that happening now? It may be that 4K is a better capture medium than a display medium for several reasons. And, by the way, here I reference the term 4K, as opposed to UHD. 4K is a capture resolution and UHD is display resolution. The camera conversation is essentially the same as the television conversation. 4K is about four times as much detail as 2K. If you’re producing sports and you really want to see where the ball was downed, which car nosed out the other, or who tipped the ball out of bounds, detail is critically important. If you’re emulating a French New Wave film and you want the picture to look grainy and soft, you might not choose to shoot in 4K. Maybe. The more pixels you have, the easier it is in post-production to enlarge a section of a frame. This means that if a shot was handheld and the camera operator had a bit too much Red Bull at lunch (and the shot is kind of shaky), an editor can post-stabilize the shot and lose some its periphery without losing any detail. The higher the signal-to-noise ratio that may be captured in a frame provides greater discretion and choice to manipulate the image during editing or color correction. In other words, you have an image (it’s really data, folks!) that is rich in information and the more information you have, the more you can exploit and manipulate it. A major disadvantage is that 4K simply takes up more storage space – four times as much as 2K. An hour of 2K material is about 25GB, while an hour of 4K media is nearly 100GB! Yeah, you’re going to need a lot of drive space. 4K is simply not a chimera. It’s not going to provide you an answer to all your capture and display needs. Yes the pictures are gorgeous, but there are downsides. 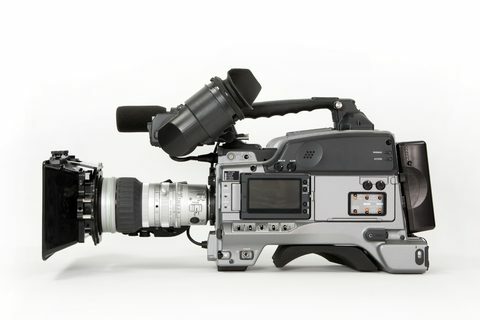 However for some purposes, it may be a very useful tool in your video production tool kit.